Last week the Spotlight series was in Claremont taking a look at The Spot Cafe. This week we travel to Upland for a slice of classic New York style pizza. Born in Marsala, Italy, Biagio Babia and his wife Petronilla made their way to Brooklyn, New York in the 70’s until they eventually took the opportunity to run their own pizzeria in Pomona. Picnic Pizza was located at the old Indian Hill mall in Pomona but eventually the mall began to close down in the late 80’s. Biagio took the opportunity to open up the first San Biagio’s on 7th and Mountain in Upland in 1988. Specializing in New York Style pizza, San Biagio’s has become a local neighborhood staple and still stands and operates at its original location nearly 30 years later. In 2009 a new location was opened up off Campus and 19th in northern Upland. The second location serves the same delicious New York pizza and speciality Italian dishes that the original is famous for and carries on the family tradition. We had an opportunity to talk to Biagio and his son Claudio about their story while getting a taste of what’s made they such a successful pizzeria for the past 30 years. Some of our favorites mentioned in our Spotlight are featured below. It’s said that if you want to judge the quality of a pizzeria you have to start with the plain cheese. San Biagio’s Pizza knocks it out of the park with their New York Style cheese pizza and they up the ante by selling them by the slice, perfect for a quick meal on the go. Subs are topped with extra sauce and cheese and baked to get that ooey-gooey consistency. 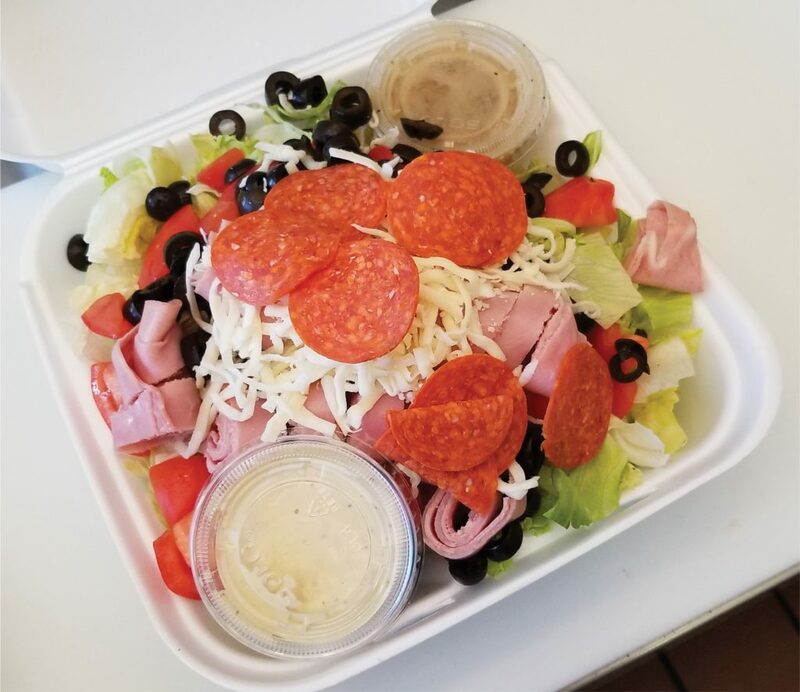 A salad stacked in fresh toppings is always an amazing option to accompany a slice of pizza. Antipasto salads are part of any formal Italian meal and consist of deli meats, cured meats, cheese, olives, peppers and various other vegetables. Classic cheese pizza, stuffed Calzones and Stromboli.